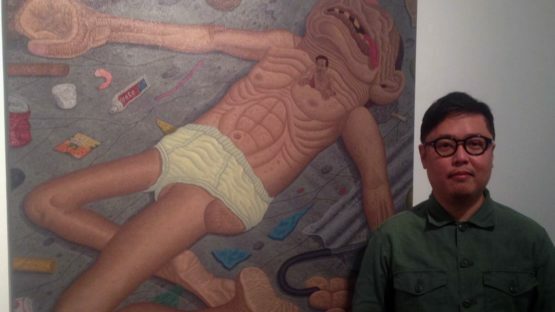 Louie Cordero is a Manila-based artist from the Philippines whose body of work is underlined by an air of ambiguity – his artistic world is often described as bizarre or riotous, and sometimes even grotesque or wretched. On both the conceptual and visual levels, this man’s paintings, sculptures and installations are informed by the complex history of the Philippines. Whenever he is depicting figures from Filipino mythology, Cordero includes blood, gore and military imagery to reflect the eclectic and often violent mix of his nation’s indigenous culture and its mixed legacies. Besides his nation’s folklore, Louie also states that he is inspired by a wide range of fields like kitsch, Indian advertising, American B-movies, comic books and pulp fiction. Regardless of whether he is making one of his paintings, sculptures and installations, Cordero usually uses anatomical innards, muscle tissue, veins, and eyeballs to construct a new, not quite unclassifiable species that has evolved through his forms, shapes and patterns. Louie juxtaposes these creatures with iconographies taken from the current social milieu, like the images of Catholicism, the relics of Southeast Asia and Africa, the stuntmen of lowbrow Filipino films, the primitivism of native crafts and the localized narratives of Western culture films. Many older Manila-based artists have also attempted to portray the energy of their surroundings through its socio-historical context. However, what separates Louie Cordero from the rest of his colleagues is that this author is attempting to expose political oppression by using symbolisms of poverty and consumerism concocted in a gloomy or satirical atmosphere. That way, Cordero deviates from the pre-established templates and produces his own rendition of the world around him, celebrating his country’s energy in bright, neon colors with depictions of absurdist moments. In terms of composition, in recent years Cordero has slowly strayed away from a purely figurative and symbolist portrayal in order to adopt more constructivist and abstract forms. What Makes Louie Cordero and His Art So Unique? When observed from a historical standpoint, multiculturalism, kitsch and pastiche have all been trademarks of Filipino art for quite some time now. The Philippines are a set of islands with many different dialects and traditions that were divided for a very long time between different imperial colonial forces – this played a major role in the development of this country’s artistic diversity. When observed from that perspective, Louie Cordero’s art is a perfect example of how unique someone’s work can be when developed in such an environment that supports diverse and varied creative vocabularies. This artist is represented by Jonathan Levine Gallery. Joao Ruas lives and works in Malabon, Philippines. All images courtesy of The Jonathan Levine Gallery and Louie Cordero.